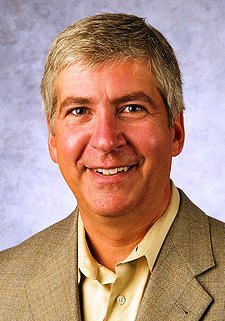 Governor Rick Snyder is scheduled to announce his infrastructure plan tomorrow in a speech at Lawrence Technological University in Southfield. According to the Associated Press, his address will include plans for roads, bridges, sewer and water systems, as well as broadband access. Additional details were not given, but I expect Governor Snyder to include a renewed push for a publicly owned bridge from Detroit's Delray neighborhood to Windsor, Canada to be a part of this plan. Since his earlier push for such a bridge went down in flames in the Michigan Senate, I expect that there will be enough other infrastructure projects in other parts of the state - all tied to this bridge - to convince enough state legislators to agree to build the new bridge to Canada. I am of the opinion that the new bridge is a good thing for Michigan. If it is included, I'll be happy - even if a few other road projects have to be included in other districts in order to get this through the legislature. 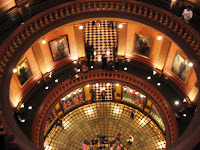 The one other thing that I am going to watch closely is Governor Snyder's proposal for increased broadband access. This is one of those things that could be either very good or very, very bad. I love the idea of everyone having high speed access to the internet. I think it's a great way to connect people; allowing information and commerce to flow in ways that it could not otherwise happen. However, there have times in the past where such a thing was proposed - with the condition that one particular company be allowed to have control over it - not just over the building and maintaining of it, but to control what sites on the internet users are able to visit. If Governor Snyder were to propose something that in anyway interferes with or violate the fundamental principle of Net Neutrality then that would be a very bad thing. Again, I don't know if he intends to propose such a thing. I just know that he intends to include broadband access in his infrastructure proposal tomorrow and that proposals to jeopardize Net Neutrality keep being brought up. Governor Snyder's address tomorrow should be an interesting one. I will undoubtedly have a lot more to say about it tomorrow.